What is the benefit of planting fast-growers? When planted around your home, trees can create a completely different environment than what you would have without them. Not only do trees around your home add massive shade to parts of your landscape, they can make the temperature drop and give you a cooler experience than your neighbor just right across the street. They can even keep the interior of your home cooler, which means less strain on your A/C unit. Many people add new foliage to their yard because they want to create a bit of privacy from the world around them. Trees are often planted as an alternative to privacy hedges or hedge walls. They not only stop people from seeing into your property, but their thicker canopy and extra height allows the tree to block out unwanted noises such as traffic or parks nearby. We especially recommend fast-growing trees in the backyard to block nearby windows for ultimate privacy! Unless you are flipping a home or just ready to sell yours, property value is usually not the primary reason our customers want to add but it is ALWAYS a nice perk to realize how much value you are adding to your home. By adding to your landscape, and adding shade and privacy, the value of your home could go up by as much as 28%. Depending on how much you invest in your yard, you could be getting it all back in due time. This shade tree creates a classic landscape that the whole family will enjoy over the years. Live Oak trees have dense, dark green foliage that creates a large crown that spreads wide around the dark trunk. These trees are extremely drought tolerant and require low water intake, perfect for our warm, sometimes scorching, climate. The Live Oak is a great choice for planting because of its performance in the hot summer months and its ability to grow in tough soil conditions. It has a wide canopy of dark green leaves and when planted in rows it can give your landscape a privacy wall or shade barrier that provides immense overall protection. The Ficus Nitida is definitely one of our most popular trees that we notice our customers looking for when they come down to a nursery. 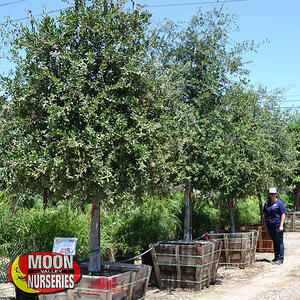 It’s also one of our most popular trees that we deliver and plant all over Arizona. The Ficus Nitida thrives in full sun exposure, but can grow in partial shade, and is drought tolerant. Since this is a fast-growing evergreen, you can enjoy more shade without the long wait. The foliage on this striking tree grows into a dense canopy that provides generous amounts of shade inside and outside of the home, when planted strategically. This semi-evergreen tree with a fun name is quickly becoming a favorite throughout Arizona. In fact, the Tipuana tipu is famous for its high-spreading canopy and attractive foliage that provides ample shade. Don’t let the hot sun keep you from enjoying your yard. Yes, if it is shade coverage you are after, there is no better tree than the Tipu. When talking about this tree, we must mention its feathery, bluish-green foliage. The foliage is not the only lovely feature. This fast-growing, colorful flowering tree puts on a show when the golden-colored blooms arrive in late spring and last to early summer. Be ready for the local butterflies that will definitely come by for a visit. 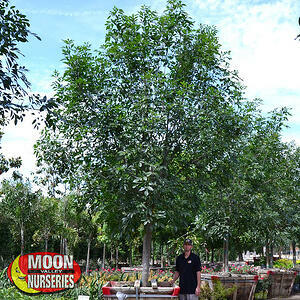 The Majestic Ash tree is an evergreen shade tree and Arizona will always need some of that around! This tree is low-maintenance and nearly pest-free, which makes it an ideal choice for planting in a yard or street plantings. You can plant the Majestic Ash as a main focal point in your yard or in a row to create long stretches of shade on your property. A row of these trees will also give your yard additional privacy. The classic, larger-leaved green foliage compliments the canopy with its dense and unique growth. 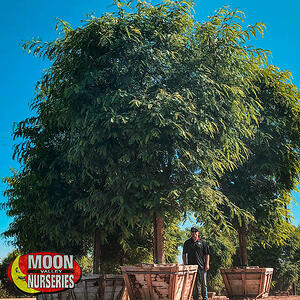 This Majestic Ash tree originates from just south of us, in Mexico. As it is not too far from home, these ash trees do great in our climate. 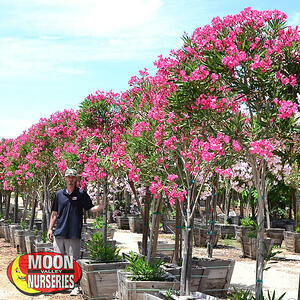 The Oleander tree loves the hot summer months, which makes them an ideal tree for your Arizona landscape. The Oleander tree displays a long-lasting bloom that comes in the form of red, white, and pink clusters. The blooms are vibrant and may extend into the winter months. Ideally planted in groups or rows, the Oleander is a great tree for our customers who are seeking to build privacy hedges, area screens, or a property border. Because of the trees ability to keep a thick coat of dark green leaves, and splashes of color that appear for many months out of the year, this is a perfect choice when you are looking for a “living wall” for your landscape. 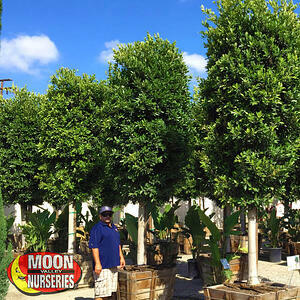 At Moon Valley Nurseries, we take incredible pride in growing and maintaining the best selection of trees for our clients. We deliver and plant anything and everything in our massive inventory. Since we are the grower, we always guarantee the best trees! All our locations have friendly nursery professionals waiting to help you get exactly what you need!